I’m not much of a baker. My cookies are often black on the bottom and fluffy things tend to come out pretty flat. In my opinion, cooking is an art, and baking is a science, and I’m much better at art in the kitchen. Go figure, since I got great marks in chemistry class way back in high school. Pre-heat the oven to 375 deg F, 180 deg C.
In a bowl, mix together the flour, cheese and chopped broccoli. 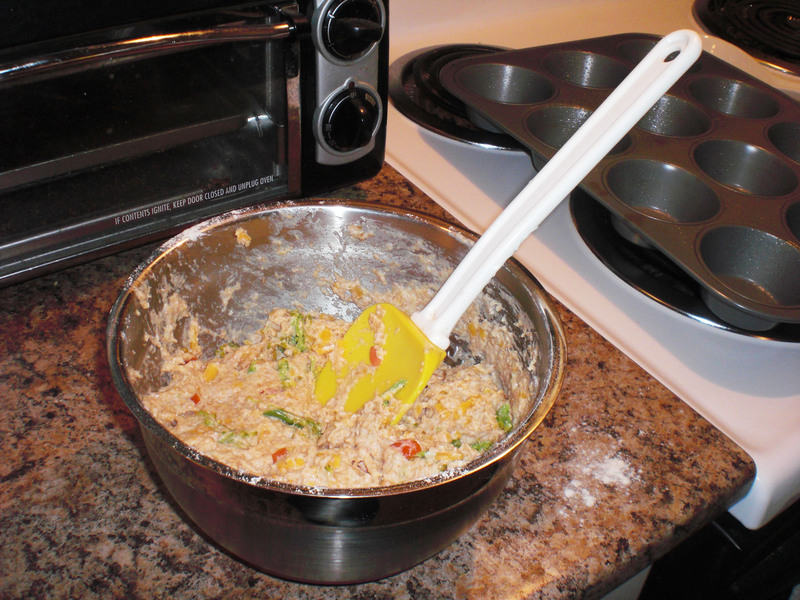 Add the chopped tomatoes, milk, oil and egg and blend thoroughly. 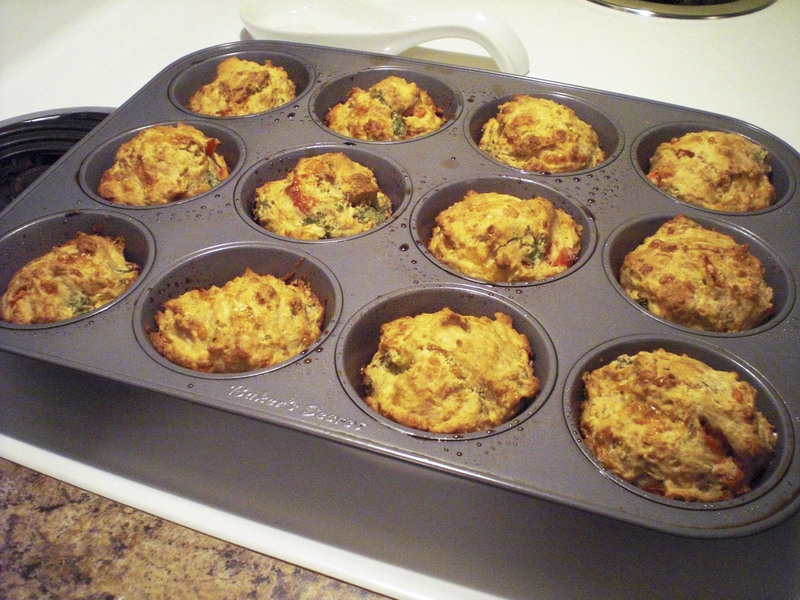 Grease a 12 hole muffin tin and spoon in the batter. Bake for 25 to 35 mins until golden. Please note that these muffins will be fairly dense and moist. Letting the muffins cool. They look tasty! I went with the formula option since A isn’t on whole milk just yet & I didn’t have any breastmilk pumped. I also only had whole wheat flour, so added the baking powder and crossed my fingers. I tested them at 25 minutes and they were dry in the middle, so I took them out to cool. Success! There were a few crumbs left over, but A ate most of a muffin. Woo hoo! They weren’t quite as moist as I was expecting, but A seemed happy enough to eat one so we’ll call that a win. 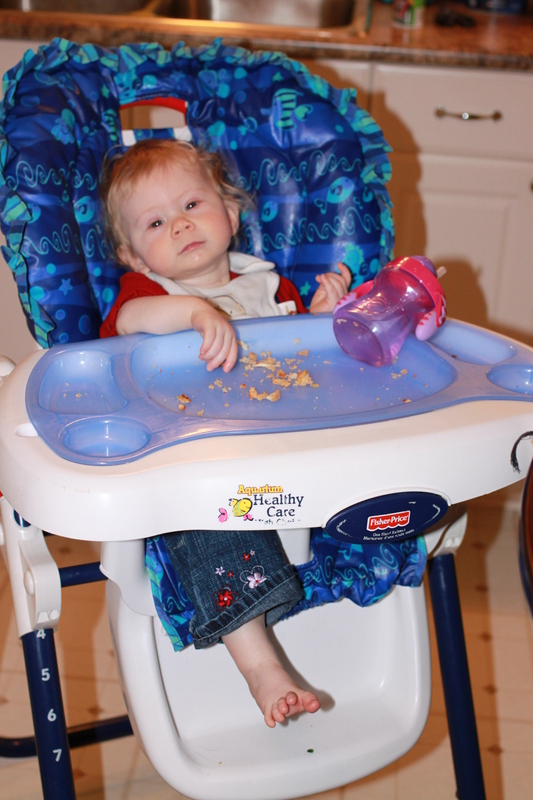 This entry was posted in Food and Nutrition, Uncategorized and tagged baby-led weaning, Baking, cheese and broccoli muffins, finger foods, food, Muffin, nutrition, parenting on November 26, 2013 by lovelaughlaundry.